Before Calcutta (now Kolkata) became an ‘Imperial city’ it had, according to Captain Alexander Hamilton in 1710, ‘docks for repairing and fitting ships’ bottoms’. Most likely Armenian traders used these docks to trade with ‘China to the East and Persia to the West’ many decades before Job Charnock founded the city, clubbing together the three swampy villages of Kalikata, Sutanuti and Gobindapur. It is from Calcutta that the British, according to Geoffrey Moorhouse in 1971, created ‘an empire at which they looked with incredulous elation’. After Calcutta had emerged as the leading port of Britain’s Indian empire and as its capital, its importance grew several fold when the Suez Canal opened in 1869. The river Hooghly made navigation difficult, as it continues to do today, but the huge returns from trade never failed to entice the freebooter and the brave. A Dutch fleet of seven ships even negotiated the channel without pilots (as ships entering Calcutta rarely did) in 1759 – two years after the battle of Plassey – in a futile bid to stop the English from using Calcutta port ‘as an entrepot’ to create the financial sinews of one of the greatest empires the world has ever seen. Indian policy makers may worry about China’s maritime encirclement by a ‘string of pearls’ (by China-constructed ports like Gwadar in Pakistan, Hambantota in Sri Lanka, Kyauk Pyu in Myanmar and possibly Sonadia in Bangladesh), but the KoPT chairman is looking at a China-India road with extensions to Tibet as possible options to augment the future business of the port. In fact, India’s considerable diplomatic leverage in Nepal and Bhutan owes much to Kolkata port being the official port of the two countries. With all its economic muscle, China cannot provide a port to service Nepal and Bhutan and this significantly adds to India’s ability to influence these Himalayan nations. The Chinese, for their part, have identified the Kunming-Kolkata (K2K) corridor, now popularly known as the proposed BCIM (Bangladesh-China-India-Myanmar) corridor, as one of the six economic corridors to be developed under President Xi Jinping’s Maritime Silk Route and ‘One Belt One Road’ (OBOR) initiatives. In May 2015 Chinese Vice-Premier Zhang Gaoli listed six economic corridors: (1) China-Mongolia-Russia (2) China-Central and Western Asia (3) China-Indo-China Peninsula (4) China-Pakistan (5) Bangladesh-China-India-Myanmar and the (6) New Eurasian Land Bridge. All of these corridors aim to enhance Asia-Europe connectivity, attracting billions of dollars in Chinese investment to stimulate trade. 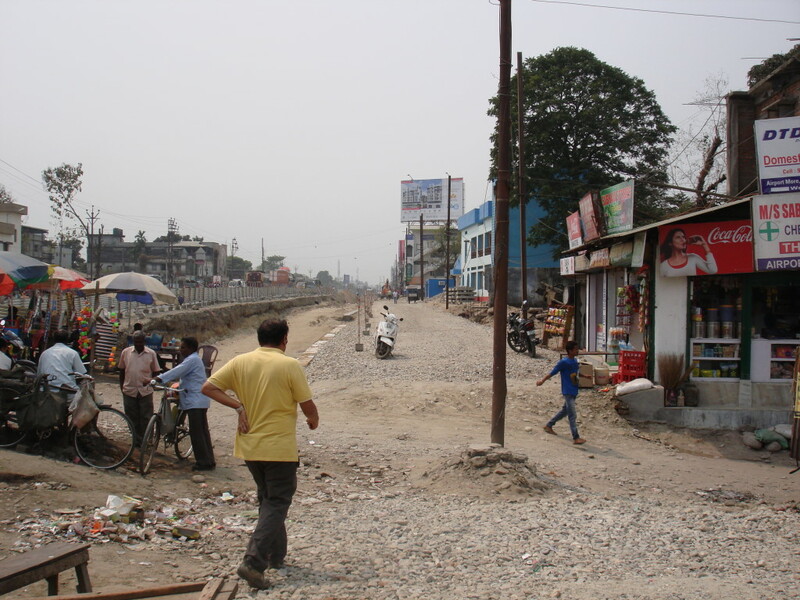 New Silk Road, Siliguri, 2016. Photograph by Ned Rossiter. The BCIM corridor, which aims to connect Calcutta (Kolkata) to Kunming in Yunnan province, is one of China’s largest priorities. India is not showing the same level of enthusiasm and commitment. But by getting India to pair up Kunming and Calcutta (Kolkata) as sister cities during Prime Minister Modi’s Beijing visit, China has made its intentions clear. Its limited east coast has compelled China to develop multiple land-to-sea accesses into the Indian Ocean through both the Bay of Bengal and the Arabian sea in order to avoid the Malacca Straits (most Chinese security analysts see this as a ‘chokepoint’). Besides Kyauk Pyu in Myanmar and possibly Sonadia in Bangladesh, Kolkata could serve as the third land-to-sea access in the Bay of Bengal for China. But that could only be the case if India sheds its inhibitions and operationalizes the BCIM corridor. This seems to be China’s long-term perspective – use Calcutta as the third opening into the Bay of Bengal – and this is a prospect mutely highlighted in the KoPT chairman’s message in June 2014. The Kunming-Kolkata corridor will not only rejuvenate the economies of south-west China, northern Myanmar, Bangladesh, east and northeast India, but will also connect to the proposed Amritsar-Kolkata growth corridor in India. Calcutta is thus the only Indian city that can connect a trans-regional corridor with an important Indian domestic growth corridor and the port system of the city will sustain a unique convergence of regionalization and globalization. It is no wonder, therefore, that during the 2014 K2K Forum in Kunming it was decided to, ‘develop several initiatives for greater connectivity between Kolkata and Kunming, with the BCIM economic corridor in mind’. But even if the Kolkata-Kunming corridor does not materialize soon, Calcutta will remain the ‘starting point’ of India’s ‘Look East’ policy and its port system will be crucial for India’s multi-modal connectivity to nations further east. After signing the coastal shipping agreement with Bangladesh during Modi’s Dhaka visit in June 2015, India seems to have taken the first steps in that direction. Since Bangladesh and India will now bypass Asian hub ports like Singapore and Colombo and move cargo to their own ports directly, the Calcutta port system, soon to include a deep sea harbour at Sagar island, will be crucial to connect to India’s neighbours further east. Despite its locational advantage, the Calcutta port has struggled to survive. Draught in the Bhagirathi, the branch of Ganges flowing into West Bengal, has continued over the years due to siltation. So much so that grants from the central government for dredging are seen as critical for the operability of the Calcutta port. At Kolkata the draft is never above 5 metres. At Haldia, it is around 6.5 metres. Calcutta and Haldia can accommodate Panamax ships (those that are capable of traversing the Panama canal fully loaded) – but only by reducing their cargo by half or more than half in other Indian ports or at the mouth of the river (from there the cargo is transported by smaller vessels). As a result, Calcutta port’s cargo volume has dropped from the historic peak of 57.32 million tonnes (MT) in 2007–08 to 39.88 MT in 2012–13. Through some local marketing moves and technological upgrades the handling volume may increase slightly in the future, but not significantly. According to Atin K. Sen, large numbers of exporters and importers who want to use Calcutta port for its splendid location are troubled by the rising costs of docking there, which leads them to being less competitive. 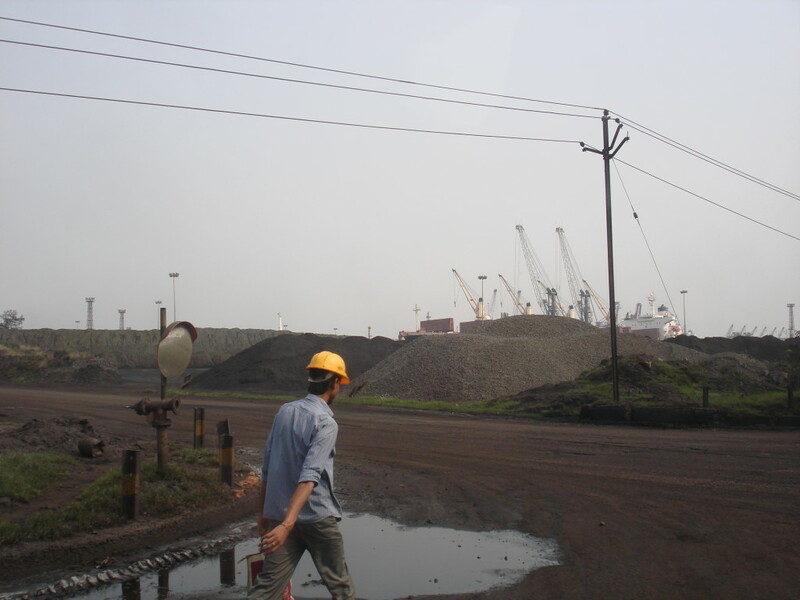 Haldia Port, 2016. Photograph by Ned Rossiter. Huge volumes of silt brought down the Ganges are deposited in its lower course and adversely impacts the Calcutta-Haldia port system. The development of the Haldia docks further down the river in the 1970s did provide some relief to Calcutta’s British-era Kidderpore docks, but now the draught has also begun to drop at Haldia. This has necessitated the development of a deep-sea port at Sagar (draught: 9 metres) or a coastal port further down the delta at Tajpur (draught: 12 metres). Dredging has become key to the survival of the Calcutta-Haldia dock systems and the Indian government, which owns the port, has to put in INR 3–4 billion a year for dredging the Bhagirathi to keep its channels navigable. According to a newspaper article in 2013 the real beneficiary in this situation is the state-owned Dredging Corporation of India for whom Calcutta port is its largest customer. Since the new Indian government, headed by Prime Minister Narendra Modi, is considering phasing out most subsidies as a matter of policy, the dredging subsidy is likely to be reduced. As Sanjoy Sen, former Chairman of the Eastern India Shippers Association, said in mid–2015 the concept of using funds saved from slashing the dredging subsidy for setting up a new deep sea port off Calcutta has been mooted by many since the late 1990s. In May 2013 the Indian government approved the setting up of a new deep sea port at Sagar Islands in the Bay of Bengal near the confluence of the Bhagirathi and the sea. West Bengal’s new Trinamool government is all for the Sagar Islands port but is also pushing for a coastal port down the delta at Tajpur because it offers better draught and will take less funds to construct. These ports, though, may take five to seven years to be operational given the slow pace of implementing infrastructure projects in India. In neighbouring Bangladesh, for similar reasons, the government is going ahead with the construction of a deep sea port off Chittagong. Earlier, Sonadia was chosen as the location and China had agreed to fund it. But now Matarbarhi has been chosen and Japan has agreed to finance the project. Many suspect Indian and US lobbying behind Dhaka’s change of mind. A global tender for the Matarbarhi port project has been slightly delayed but Bangladesh says the project is on course. Like Chittagong, Calcutta is a traditional port and experts say its handling volume cannot be improved merely by port modernization. Only a deep sea component, promising substantial draught capable of handling large modern container-carrying vessels, can ensure the future survival and success of the Calcutta-Haldia port system. The Indian government has already committed INR 12,000 crores to the Sagar deep sea project. But Delhi has made it clear it would not fund the Sagar deep sea port if West Bengal government wants to go for the new coastal port at Tajpur. The Bengal government has said Tajpur promises better draught and would entail one-third the cost of developing the Sagar deep sea port (INR 4.23 billion against Sagar’s INR 12 billion). The Indian shipping ministry considers two ports so close to each other would not be viable in view of current volume of trade. The key to the whole exercise is balance phased cutbacks of the dredging subsidy for Calcutta-Haldia port to ensure funds for the timely implementation of either Tajpur or Sagar deep sea project. Since the Modi government is keen to revamp internal water transport in India, dredging the Ganges can never be totally eliminated. Calcutta’s old riverine port is being revived as a port system with a deep sea and/or an additional deep draught coastal component to provide multiple options. While the heavier container ships can dock at the deep sea port or at Tajpur, the lighter ships can dock at Haldia and still smaller vessels at Calcutta. When the deep sea port and/or Tajpur are complete, the KoPT can convert the Calcutta docks specifically for barges. Bigger ships will then only dock at Haldia and Sagar/Tajpur, but Calcutta docks will be available for inland water transport and light barges from neighbouring countries like Bangladesh.